What is cloud-init and why do you want it? It gives you the ability to script your server build! This gives you repeatability and a history (assuming you put your script in a git repo). How do you typically use it? 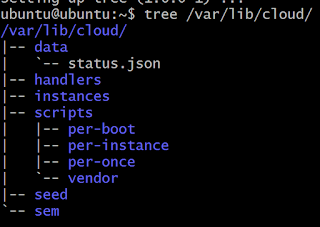 I use Ubuntu, and most Ubuntu cloud images already have cloud-init installed. With that in mind when I kick off a new server in the cloud I also hand it a cloud-init file to run on start up. Well usually you would not need to, assuming you are using some cloud service like Amazon Web Services or Openstack, chances are your VMs have cloud-init installed. But, what if you are not in the cloud? I currently have plans to build out an Openstack set up at home, but that keeps getting delayed. In the meantime I have an ESXi box I use to run my test VMs. 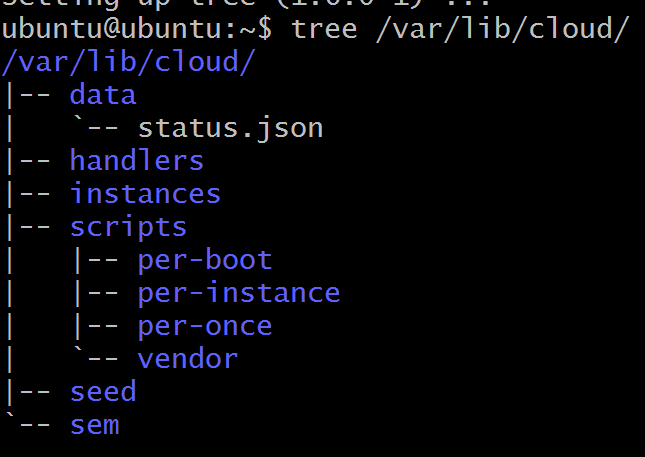 I've gotten so used to using cloud-init in Openstack or Amazon that it drives me a little crazy when I have to build a machine locally in VMWare and manually install packages and set the box up. I would rather do it the cloud-init way. I have created a base Ubuntu 14.04.04 machine image in VMware Workstation. The main user is named ubuntu, which follows the typical Ubuntu Cloud image setup. I set up all my ssh key stuff so I can log in as the Ubuntu user via ssh keys and no one can login via passwords. Cloud-init is installed by default on Ubuntu Cloud image https://help.ubuntu.com/community/CloudInit , but it is not installed in a typical non-cloud installation. First let me prove I don't have cloud-init installed. Looking over this file it looks good for my purposes one thing to note is in the system_info section you can see the default_user is the ubuntu user. 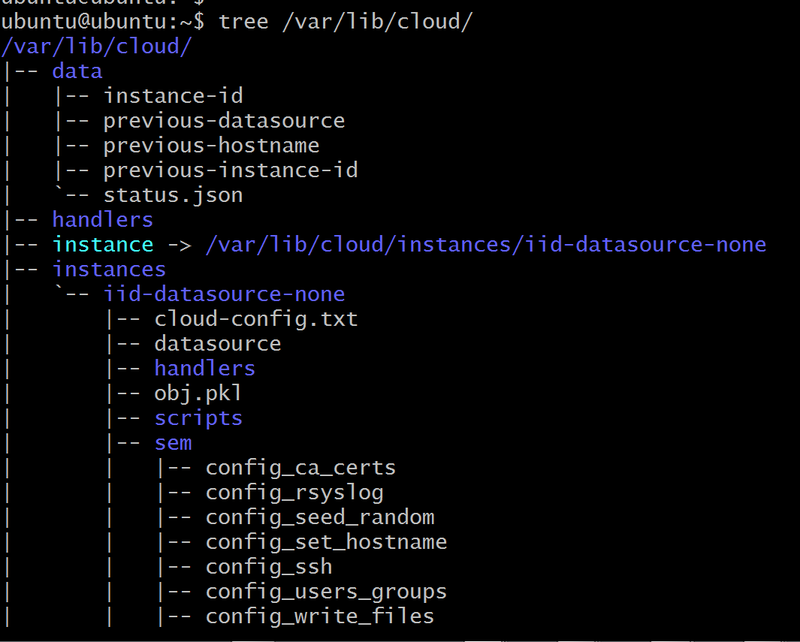 I am used to passing in a file via an AWS or Openstack command that then is used when a new VM starts up. But, in this case, I have an image already running. So what is the best way to run a my cloud-init script? Poking around I found this site https://raymii.org/s/tutorials/Automating_Openstack_with_Cloud_init_run_a_script_on_VMs_first_boot.html  Looks like a good resource. # Need to debug later. Then attempt to run it manually. I think this is a bust. Going back to an older VM snapshot. 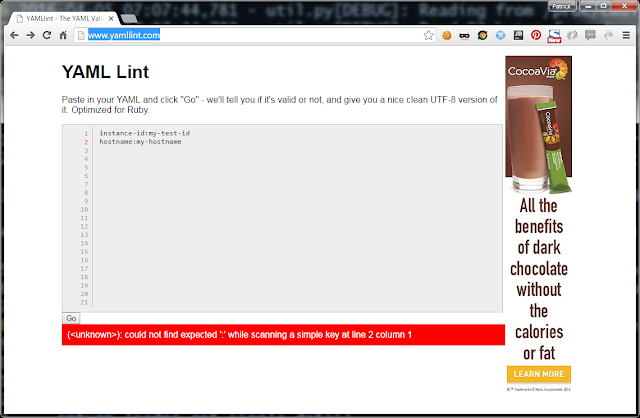 Between that site and a few others I have been looking at it seems cloud-init needs to files fed to it to work. One is the user-data file which is the cloud-init file I am used to feeding into an EC2 or Openstack instance. The other file it needs is the meta-data file. This is a different beast I am not used to. You can use these yourself to retrieve data about the machine. Ex. From my reading I could set up a URL to point to in the cloud.cfg file. But I don't want to do that just yet. I want to just simply place a meta-data and a user-data file somewhere and have them run locally. … But I can't get back in. 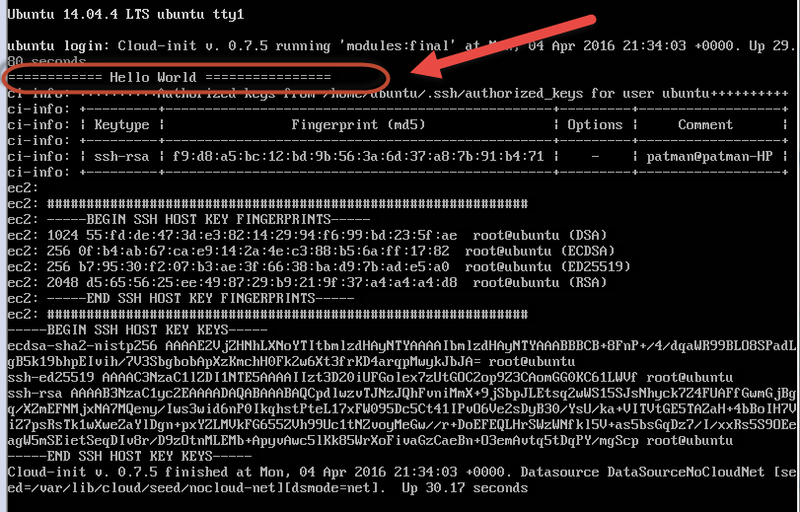 It seems to have overwritten the default password and ssh key for my cloud-init user named ubuntu. The user-data seemed to load, but I am not sure what is going on with fiddling with the Ubuntu user. My best bet now is to make a better user-data script that creates a new user I can login with. Of course put in your actual password from /etc/shadow and your actual .pub ssh key. Had an extra space where it should not be… well should actually add a space on the next line. Looking around I found this http://askubuntu.com/questions/153486/how-do-i-boot-ubuntu-cloud-images-in-vmware  The approved answer did things a little more simple than what I was attempting to do. So I am going to follow the example and make it simple! This will set the password for the ubuntu user to mypassword. But it does require you to change it on first login. Yep it uses the new password to login and forces you to reset it on first login. 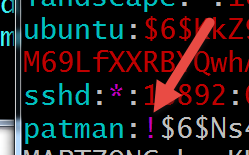 So it did not wipe out the .ssh folder on ubuntu. Good. Let me see if I can tweak this and not break it. # Reboot the machine when done. Installs a few packages and forces a reboot. htop and tree were installed! OK, let me see if I can add a user now. Hmm denied… Oh wait I think I know why! See the ! in front of my password. That says this user, even though they exist, are not allowed to login. And also just use sudo to confirm my password works! I am getting pretty close to what I want. Or at least able to exercise a lot of the tools in cloud-init I use. Next I want try runcmd to fix my user lock and also to fix the sudo issue resolve host warning. Now it should fix the /etc/hosts file so no more sudo warnings. Also should unlock my user. Let me see if I can login now. That gets me most of the stuff I want for now. Well… There are two more things I would like to try. Hopefully this will set my /etc/network/interfaces and give me a static IP address. Now I should be able to ssh as the ubuntu user and not use my .pem key. Oh and the IP address should be different. OK looks like IP address did not change, let me try the old one. Hey that worked! But my IP address did not get updated like I had hoped. That is not what I wanted. I tried several different ways of doing this and all failed. 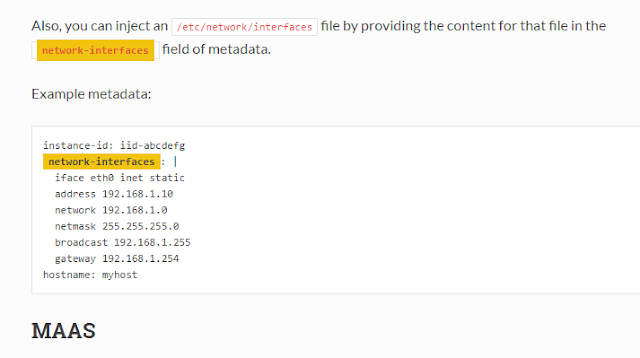 I found a good example here http://cloudinit.readthedocs.org/en/latest/topics/datasources.html?highlight=network-interfaces#no-cloud  I think I am close to correct. Maybe it works in a new version of Ubuntu. Pretty soon I will be switching over to Ubuntu 16.04 LTS and maybe that will fix my problem. But for now I am using Ubuntu 14.04 so I think maybe I can update the /etc/network/interfaces file in the cloud-config file. Use write_files to create a new /etc/network/interfaces file. # Files to write out. Also if I try to login with my password for the ubuntu user I need to use the password set in the cloud-init file. It is mypassword and requires you to reset it after login. I don't recommend doing it this way and I will probably remove this from an eventual cloud-init file I will use. And tree and htop should be installed. Hey it's all working!! Cool I got what I wanted. I still need to work out how I am going to save config files in a git repo and deploy them to a server… but at least I got a basic setup working and I can expand from there. How do I boot Ubuntu Cloud images in vmware? Awesome! Thanks for documenting your experience. Helped me quite a bit. Nice way to explain step by step. awesome post ...thanks a lot !